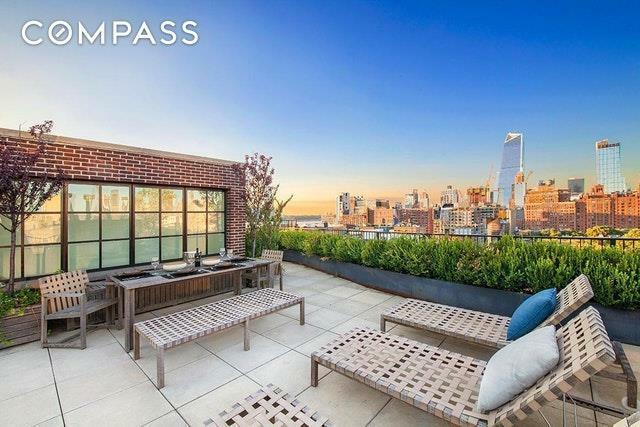 Enjoy breathtaking 360-degree views in this immaculate two-bedroom, two-and-a-half bathroom West Chelsea penthouse with three private outdoor spaces. Measuring an impressive 3,500 square feet over three levels with 2,353 interior and 1,167 exterior, there is no shortage of space for luxurious entertaining and effortless relaxation in this high floor home. Enter the lower level and take in the home's signature towering art walls and spectacular golden light. Massive steel casement windows frame dramatic picture-postcard views and add a chic industrial design aesthetic throughout. Thanks to impeccable design by architect Felipe Diniz, the open-plan great room features a commanding chandelier that draws the eye to the double-height ceiling while a gas fireplace adds warmth and intimacy to the airy and bright space. In the renovated open kitchen, warm walnut, glass and white Corian surround state-of-the-art appliances by Miele and Sub Zero. A large private terrace and distinctive black-and-white powder room underscore this home's desirable layout for entertaining. The coveted split bedroom layout places each bedroom suite on separate floors. There's one on the lower level, while upstairs, you'll discover a decadent, full-floor master suite with large lofted home office/sitting room. The bedroom is lined with custom closets and open-sky views, while the tranquil en suite bathroom features calming marble and mosaic tile, an oversized rain shower and dual-sink vanities.A glorious landscaped private roof deck is this home's crowning glory. Equipped with a bar, wine refrigerator and outdoor shower, here you'll lounge, entertain and bask in sweeping views the stretch from Downtown to Midtown and beyond. 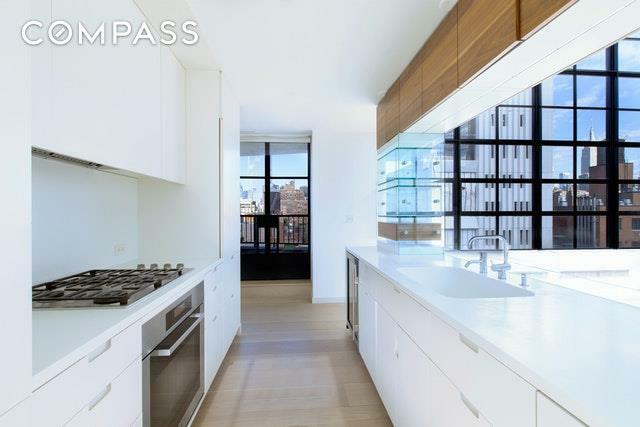 No detail was overlooked in this premier West Chelsea showplace. Window glass offers UV protection and remote electronic shades are installed throughout; wide-plank white oak floors are sustainably sourced; and an in-unit washer-dryer and central air conditioning ensure comfort and convenience. A building storage unit is included with this property. Designed by architect Cary Tamarkin, 456 West 19th Street is 1920s art-studio-inspired brick-and-steel building. The welcoming lobby boasts polished concrete floors reminiscent of the surrounding art galleries, and the LEED-certified boutique building offers a 24-hour doorman, on-site superintendent and a designer private garden. 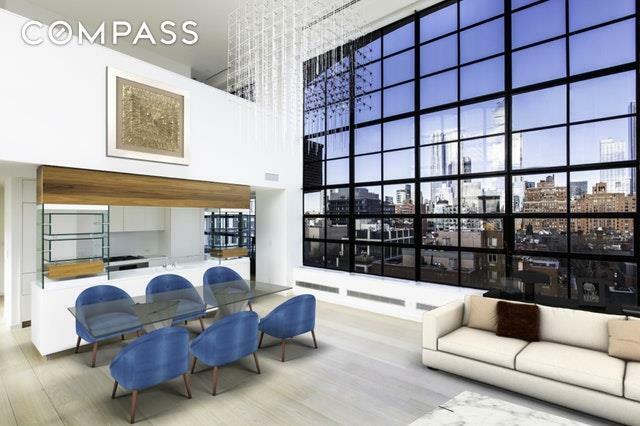 Perfectly positioned in the heart of the West Chelsea Arts District, you're just seconds from The Meatpacking District, High Line and sprawling Hudson River Park. The surrounding area is a mecca for art, shopping, dining and entertainment, including Chelsea Market, an Equinox and the Whitney Museum. 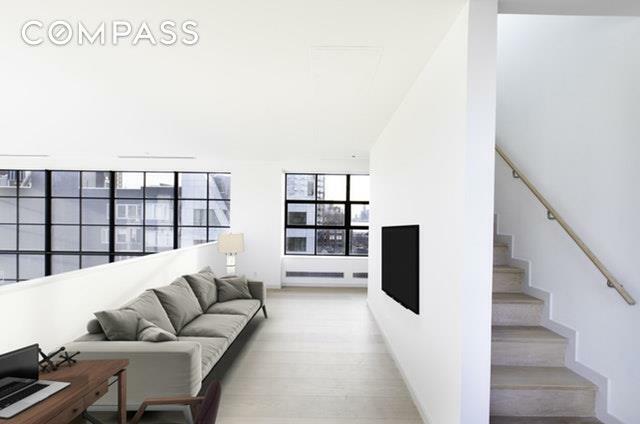 Nearby A/C/E, L and 1 trains offer easy access to the rest of the city and beyond.